I hope you've all had a great week! Ours has been a little crazy as we're finalizing a few of the final details for designing our new home. I had no idea how stressful this process is at times! Whew, just choosing door handles the other day was a process. However, J and I love nothing more than a project we can work on together, so it's been so fun to design our new space together. I literally cannot WAIT for it to be finished so I can share it with you all! You all know how much I love a causal, chic outfit and this one is all the praise hands. I've been wearing boyfriend denim literally non-stop! They're so comfortable and pair so well with a chic pair of flats or sandals. Also, I've had quite the hat obsession lately. 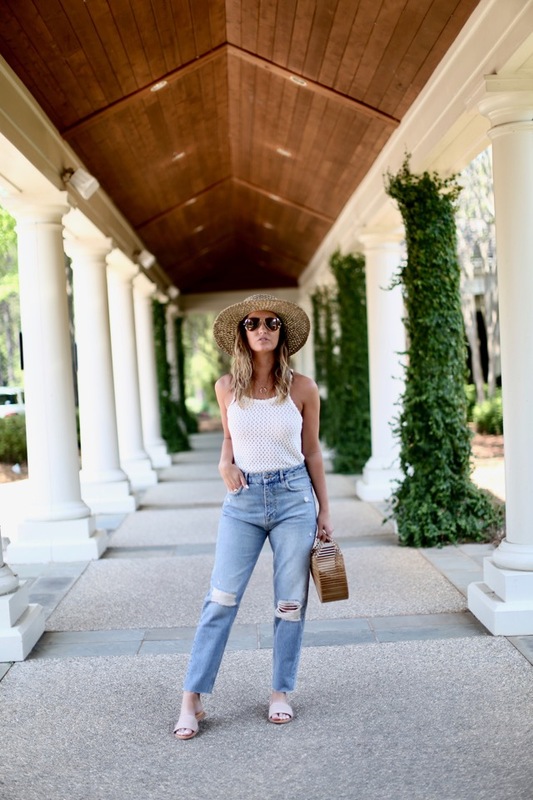 All I want to do is live my best life in a hat, whether that's a ball cap or a straw hat! Thanks so much for stopping by and cheers to the freakin' weekend, babes! x. Love this outfit! Super comfy, yet super cute! Great look! I'm dying over the second photo of you! I can't imagine that you ever take a bad photo--you are gorgeous in all the ones you take! Gorgeous photos! Those jeans are so darn cool & I love that top! Cool and lovely outfit ;) Great hat!! !